Martyn Hilbert's Railway Photography - Last additions - Class 306 EMUs at Leicester (GC). Class 306 EMUs at Leicester (GC). 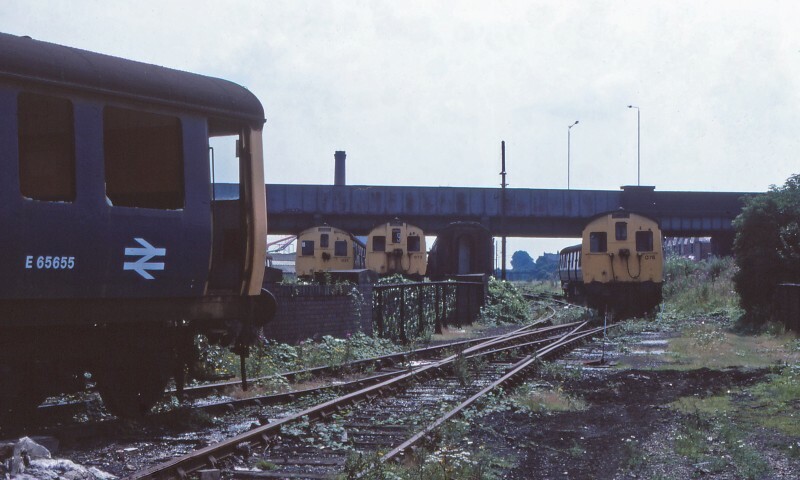 Dating from 1949, former Liverpool St-Shenfield Class 306 EMUs, 055, 033, 083 & 078 wait at the entrance to Vic Berrys Scrapyard at Leicester on July 19th 1982. The location is adjacent to the former Great Central Main Line, that last saw a passenger train in 1969 when the DMU service between Rugby and Nottingham was withdrawn. Upperton Road bridge that once spanned the extensive trackwork at this location, was demolished in 2007 - yet another bit of the infrastructure of the old GC Main Line lost forever.